Havana, Cuba, 2003: Matt, a San Diego journalist, arrives in Havana to marry his girlfriend, Yarmila, a 24-year-old Cuban woman whom he first met through her food blog. But Yarmi isn't there to meet him at the airport, and when he hitches a ride to her apartment, he finds her lying dead in the bathtub. Lovelorn Matt is immediately embroiled in a Cuban adventure he didn't bargain for: the police and secret service have him down as their main suspect, and in an effort to clear his name, he must embark on his own investigation into what happened to Yarmila. The more Matt learns about his erstwhile fiancee, though, the more he realizes he had no idea who she was at all - but did anyone? I really enjoyed the book. I am usually very critical of readers faking an accent but Cynthia does a good job at imitating the Cuban accent. The book brought memories of my childhood in Cuba. In my opinion, the author accurately describes the economical, political and social atmosphere in the Island. A must read! I found myself lost in the detailed descriptions of the characters’ experiences and was less focused on the murder per se. 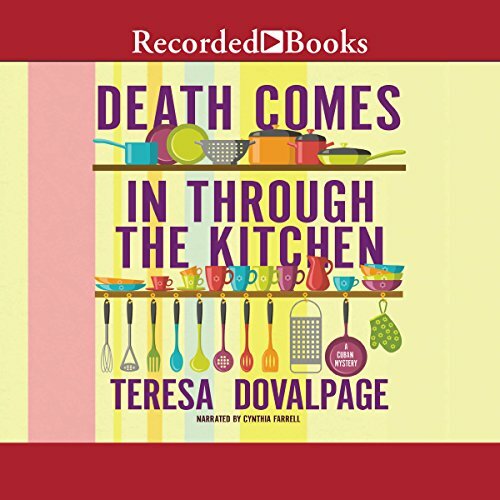 I enjoyed the recipes and often had to run to the kitchen and grab something sweet after listening to the book for a while . How I miss the merenguitos I used to make with my grandma and mom!!! Read it, enjoy it, and transport yourself to the island without having to leave the comfort of your home.